Gaming, as a medium, is old. Platformers, horror games, first person shooters, point-and-click adventures, text-based MMOs (yep, played one of those for a few years) and sports titles have been done again and again for decades now. We've seen so many of the same mechanics rinsed and repeated that whenever something new comes along, gamers as a whole sit up and take notice. 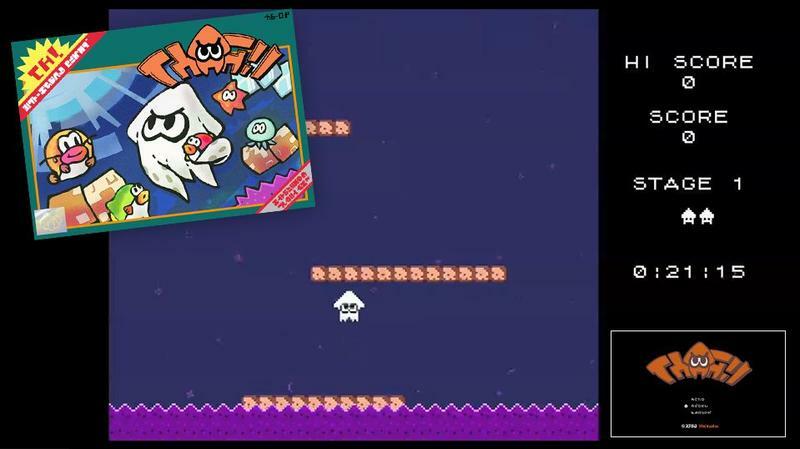 That's Splatoon. It's a retake on an old genre with Nintendo flair, and it arrives as one of the best forays into the world of online shooters that I've played in a very long time. See, my last several weeks with Splatoon have been a bit of a blessing and a curse. I've fallen in love with the game and its rather meager offerings. I'll touch on this in a bit, but there's not all that much to love with the early version of the game. It's worth loving, no doubt about that, but it's thin. The curse? The curse is that I've been damaged for other multiplayer shooters. They simply don't play as fun as this game does, even if the objectives are entirely different. 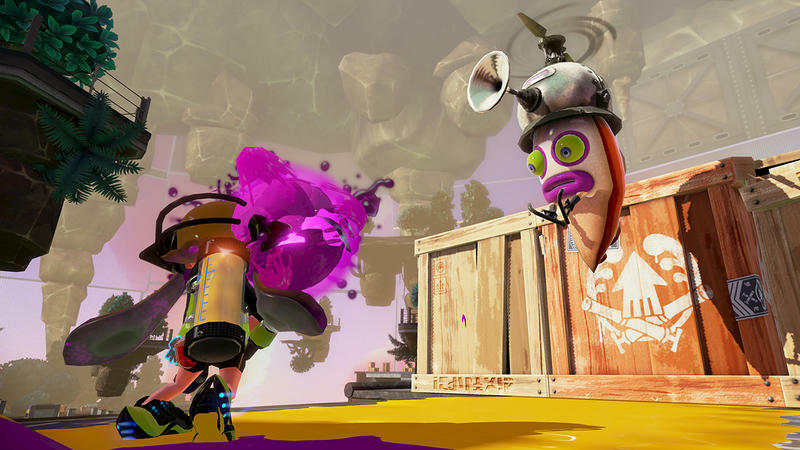 Splatoon has me rethinking online combat, and the other shooters I've tried to play in its inky wake seem almost boring in comparison. Splatoon is weird. If you've never seen or heard of the game until reading this review, you're in for a bit of a surprise. 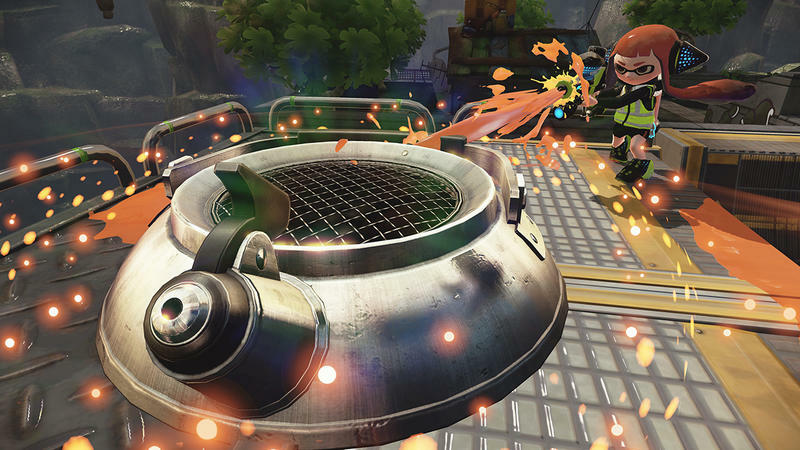 While it has a single player campaign, the core of Splatoon is its multiplayer. 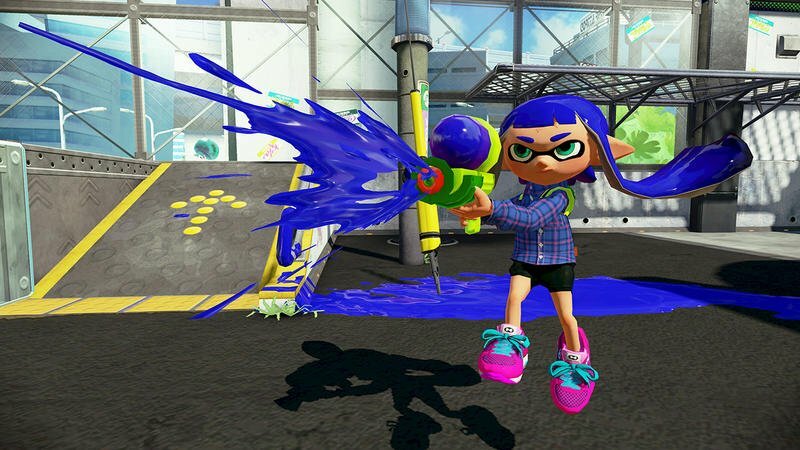 Gamers fill in the role of either a boy or girl inkling. 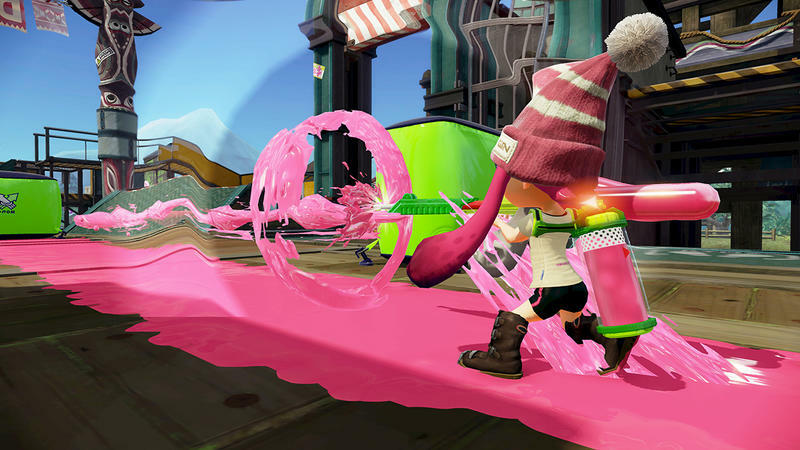 Inklings can transform between squid and humanoid at any time by pressing and holding the left trigger on the GamePad. 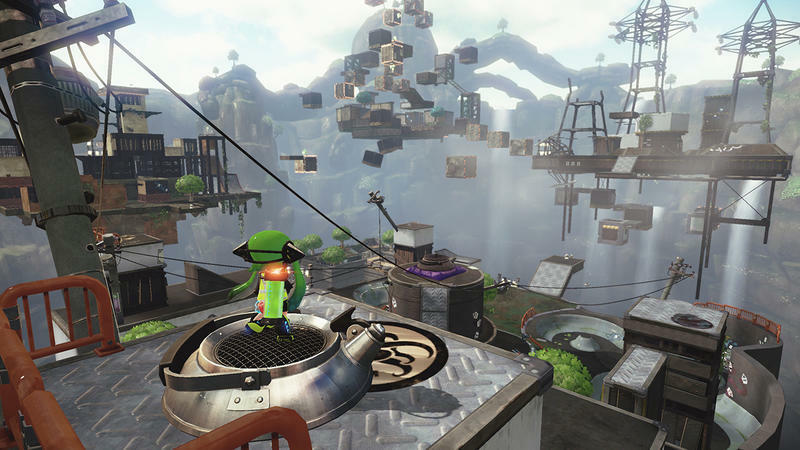 Now, the game's basic mode pits four players against four players as they aim to cover the map in their ink. Each team will have a different color, and the colors are randomly assigned. 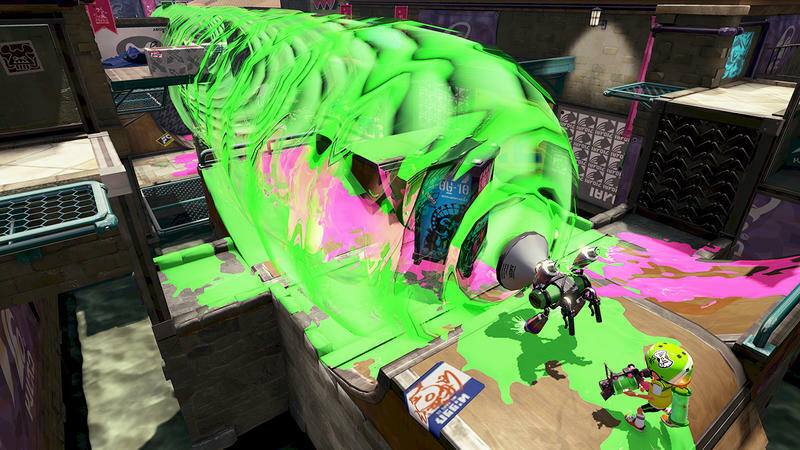 As you cover the map, you can switch to squid form in order to hide, swim and heal in your own ink. Swimming is a much faster mode of travel, too. Walk through your enemy's color and you'll get stuck, lose health and eventually die. This third person shooter, then, is less about killing your opponents and more about covering maps. As matches start, you'll race off in a direction filling in as much of the ground as you can. Fill up enough and you'll earn your weapon specific special ability. That, typically, let's you either attack or fill up even more of the map. This shift in focus from enemies to the actual environment is what makes Splatoon so much fun for someone who's spent a huge chunk of their gaming life with multiplayer shooters. The dynamic changes from fiercely one on one competitive to more of a graceful tug of war. You'll see enemies pushing through and covering parts of the map on your GamePad, and you'll constantly adjust your strategy in order to fight back. It works really, really well, and each match plays out in its own unique way. 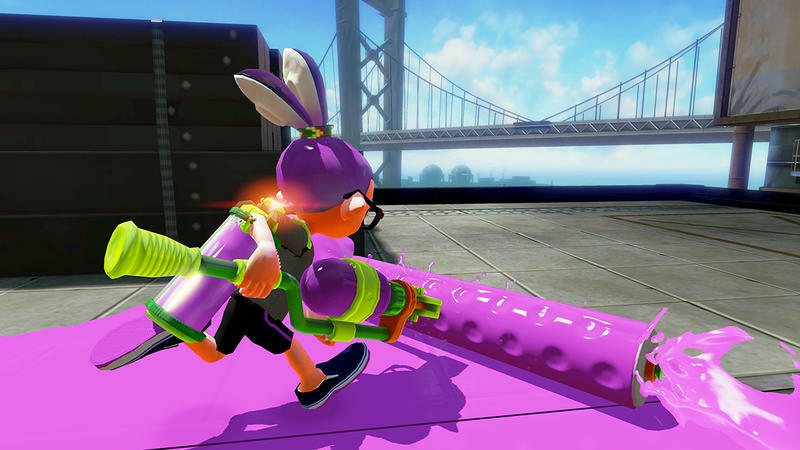 Speaking of the GamePad, I even find myself applauding Splatoon's motion control design. That's something I didn't see coming. You can turn off the motion control, but I really don't recommend it. 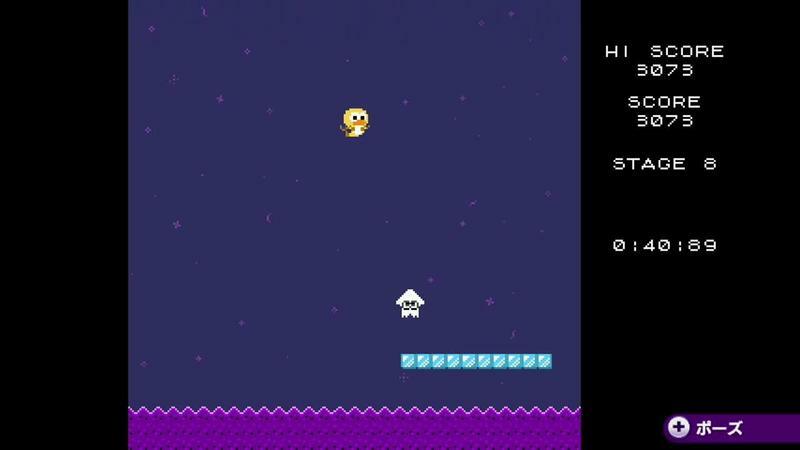 You'll have to use the GamePad because the screen lets you launch to either friendlies or the spawn point at any time. You need that ability in order to be good. This game doesn't support the Pro Controller or Nunchuck and Wii Remote configurations. The default controls are movement on the GamePad's left stick with horizontal looking on the right. 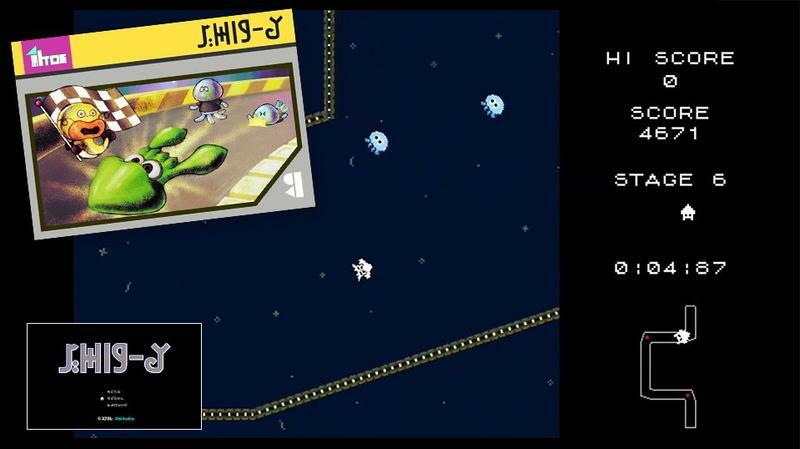 Then, you can tilt the GamePad in any direction to fine tune your aim. I hated this at first. Hated it. Then I turned the sensitivity way up, reminded myself to move with the game and suddenly found that I loved it. It was like a switch flipped during one of my sessions, and I wound up really, really digging the GamePad motion control design choice. 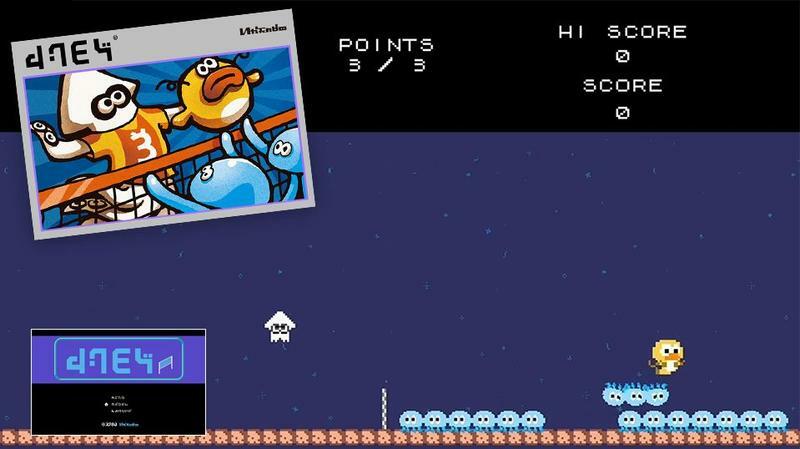 This is really Nintendo's first foray into the online shooter world. As such, they've managed to do things a little differently than other studios do. In fact, shooter veterans will probably find themselves split between pleased and pissed with some of this multiplayer ideas once they're in action. First, we have a very limited set of maps in the game. Five. I'll hammer this more in another section, but I actually like the small amount in a way that I didn't expect. And that comes thanks to Nintendo's choice to rotate maps. Before you reach level 10, you'll only have access to the basic battle mode. 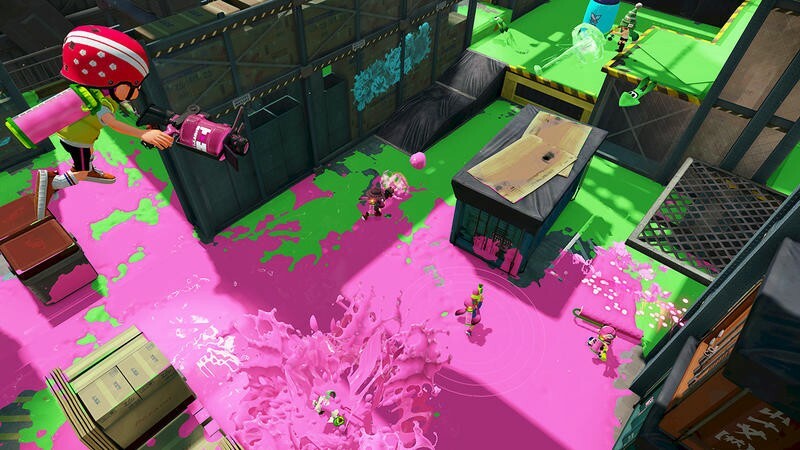 At launch, that includes only Turf War, the mode that sees players trying to ink the entire map. In this basic mode, you'll only play two maps at once. The entire online community will be restricted to these two maps, and that means you're going to play a lot of the same space over and over again. On the positive side? You'll really know the maps. Once you hit ranked mode, you can play two other maps at once within the Splat Zones. 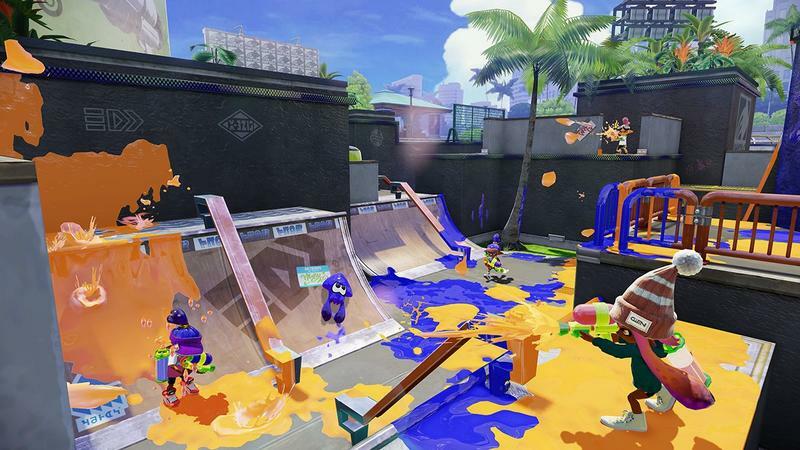 Splat Zones is essentially a moving king of the hill with ink. I do believe this rotation idea should be applauded. It pushes the entire community to learn the same maps at once, and you'll quickly find that most players are on the same level with it comes to being versed in map layout. I also really dig the gear system in this game. You can buy gear from the shop vendors. Depending on the quality of the shirt, headgear and shoes, you'll have upgrade slots in each piece. As you play the game, your gear upgrades and you're randomly assigned a new perk. Maybe it's faster running, more defense, more damage or quicker ink refills. Whatever the case, you're always going to be buying and leveling gear that matches your weapon set. You don't just pick one gun, one grenade and one special. You buy whole sets. That means you'll have to learn how to use a gun, its grenade and its special in tandem in order to play well. Every player is different, too. I really like using the midrange shooters with tight fire. I'm more accurate that way. 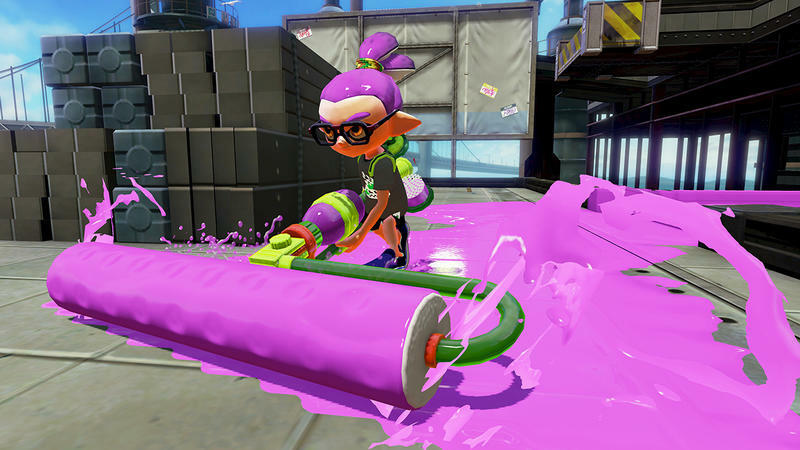 Others like the rollers that are amazing for up-close play and cover tons of space with ink. Then there are the charge shots. These are my least favorite, but a good player can absolutely dominate with them. Add in specials like the ink strike that hammers a small section of the map or the bubble shield that gives you momentary invincibility, and the right gear and tactics can make you a machine. Each set has a learning curve, and the random unlocks mean that you'll do a lot of trying out on your road to building your loadout. … but, Nintendo's ideas are light on content. As good as ideas like map rotation are in limited practice, spending a lot of time with Splatoon really starts to grind things down. 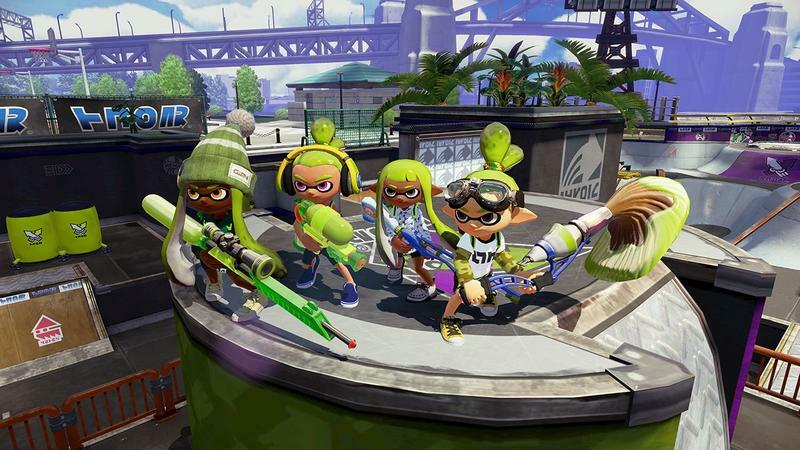 Put plainly, Splatoon is simply skimping on multiplayer content. Five maps and two online modes (one offline couch competitive mode, too) will drive any gamer crazy after 20 hours. When I hit that mark with this game, I found myself really wishing Nintendo would launch with more content. Even one or two extra maps or modes would have been enough, but right now things feel super limited. That problem won't last long, mind you. Nintendo has already indicated that every few weeks after launch will see updates of free content. 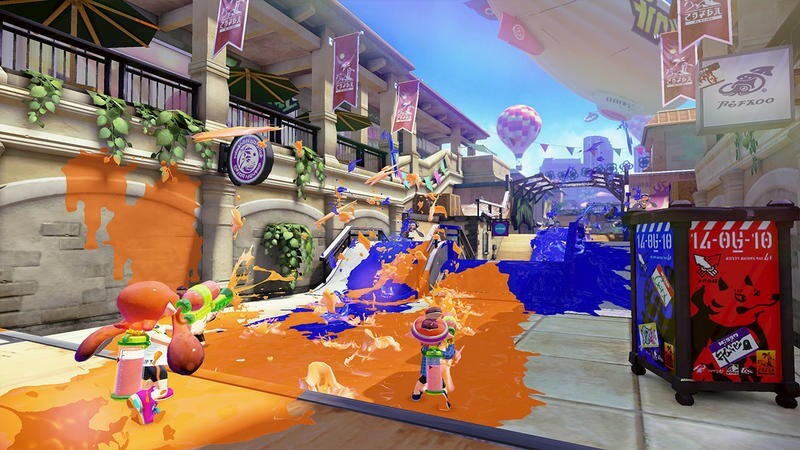 Free maps, free modes, free guns, free gear, you name it, we are set to get it as time rolls on with Splatoon. Right now? It's limited. 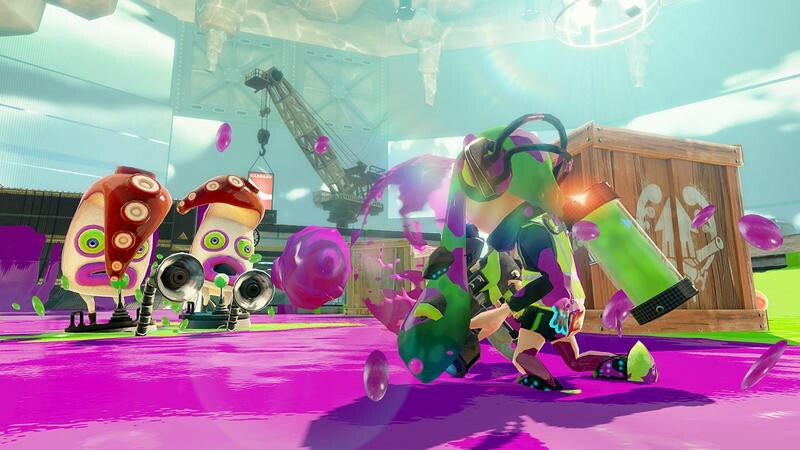 What saves Splatoon is how unique its core premise is. If any other basic shooter launched with only five maps, heads would absolutely roll around review time. 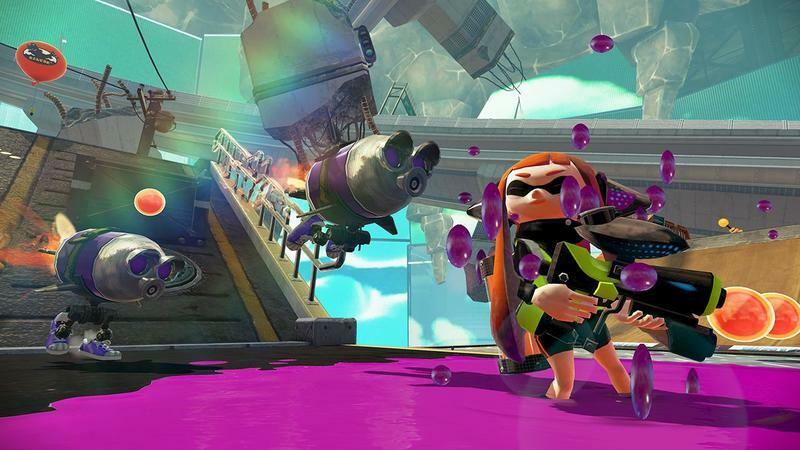 Splatoon's saving grace is that it handles its limited stock really well with a genuinely fun set of mechanics. It's just, man, I wish there was more. Then there's the lack of voice chat. Now, everyone will have a different opinion where this is concerned. Me? I'm only bummed about the lack of voice chat because I won't be able to talk with friends. I will, but it'll require a separate device and something like Skype running at the same time. I don't really like talking with randoms online, and I usually mute folks as I play anyway. Recognize, though, that there is no voice chat here. That could be a big killer for you, so take your own perceptions into account. Single player is just a solid training ground. There is a single player mode that will run you around five, six or maybe even seven hours. It took me five, but other reviewers I chatted with went a bit longer. It's, well, OK.
You're basically sent to battle octopi, the natural enemy of the squid. They've stolen your massive power source, and you're tasked with getting it back. That means running stage-to-stage in order to take on challenges. 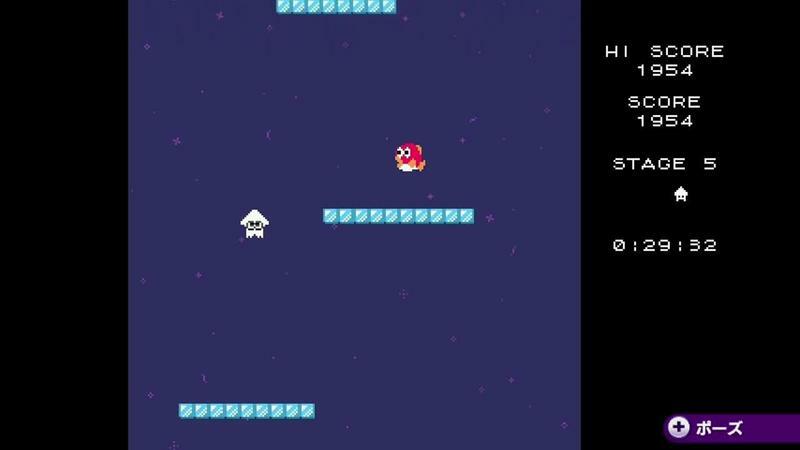 The gameplay here is fine, and each stage will last anywhere from five to 20 minutes. They'll each pack a hidden scroll which isn't too hard to find. I think I'm missing five out of the roughly 30 the campaign offers. It's annoying, though, they each level is hidden in the hub world. You'll have to walk around and shoot ink as you try and find them. They aren't on the map until you soak them with ink, and it can be a pain to locate each stage as you play. The campaign is never too challenging, and even boss battles won't kill you too often. It's simply a training ground, as far as I'm concerned. Spend some time in Octo Valley (that's the campaign's name), complete the stages, unlock all the gear you can and roll back into multiplayer. That's what I did, and I wound up OK with the results. This might be telling, though. The review copy of the game is a completely separate build than the launch one. We won't be able to use any of our progress here once the game releases as we'll be getting the retail version separately. That means all unlocks and ranks will be washed away. What's telling is that I'm not really looking forward to moving through the campaign again in order to get the gear. The little things push Splatoon forward. 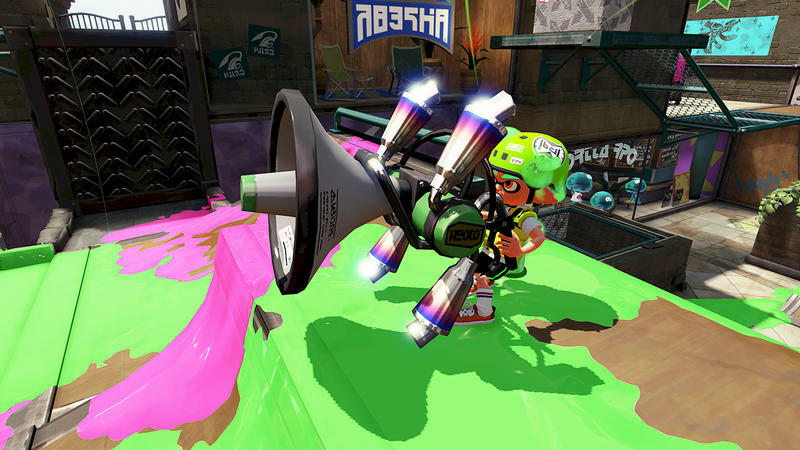 What vaults Splatoon from fun but too light on content to worthwhile to me are the extras and little things. This, in a nutshell, is what makes Nintendo, well, Nintendo. The game boasts a charming little hubworld that shows other players and their loadouts, for instance. 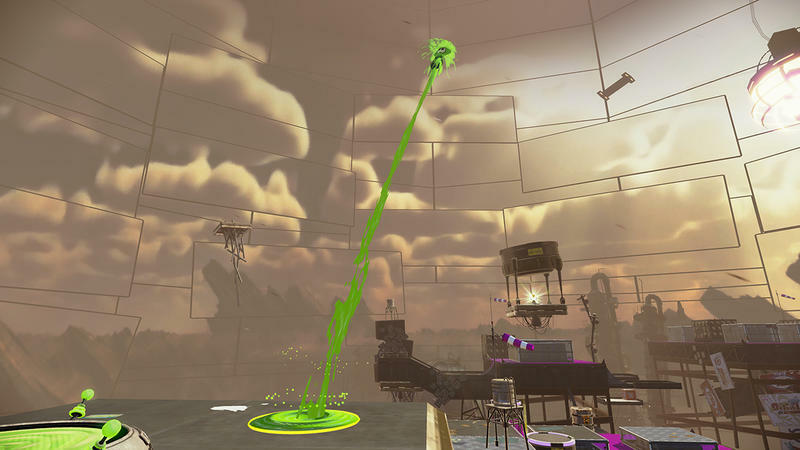 You can roam around Inkopolis, order gear off of people's backs and take in the small view. Then there are the arcade mini-games. You'll have access to one at launch, the buying the amiibo could land you three more. 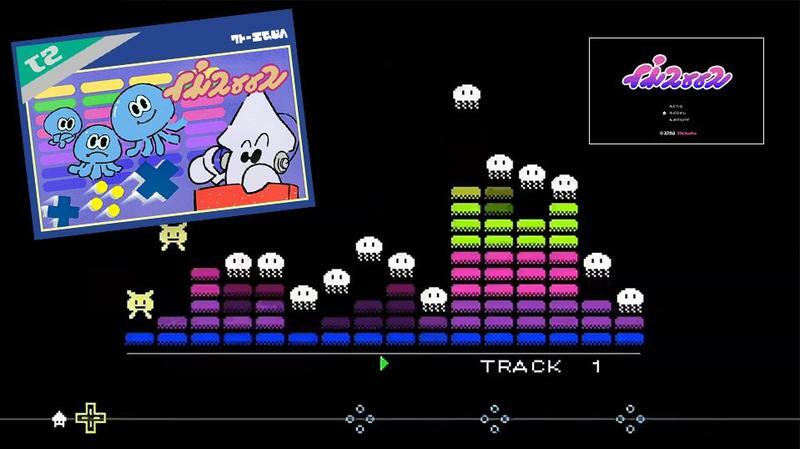 You can play the NES-themed games whenever you want on the arcade machine in Inkopolis. But, their true intention is to be played while you're waiting for matches to load up. You can't quit out of lobbies once you join them, so you'll spend downtime playing these addictive little mini-games. Speaking of the amiibo, we were sent the girl inkling during our review time. She basically grants access to stages from the single player campaign that include a twist: you have to use her charge weapon during play in order to beat them. That makes some sections tougher, and beating them will unlock gear for online play. It's a fun little distraction and certainly better than just a simple amiibo power-up, but it's hardly the thrilling extra content it could be. 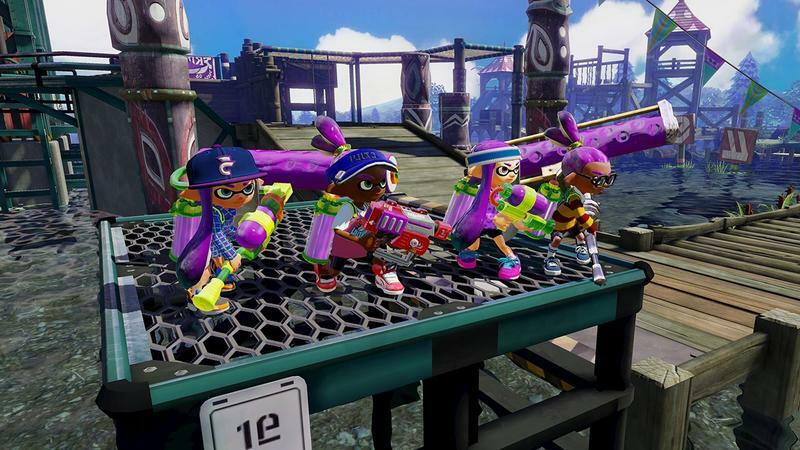 On one hand, Splatoon is an incredible take on the multiplayer shooter genre. It's Nintendo's first stab at the sector, and they've done a really wonderful job of bringing a unique mechanic change to an aging genre. The gameplay here is fun, fast, addictive and unlike anything else on the market. 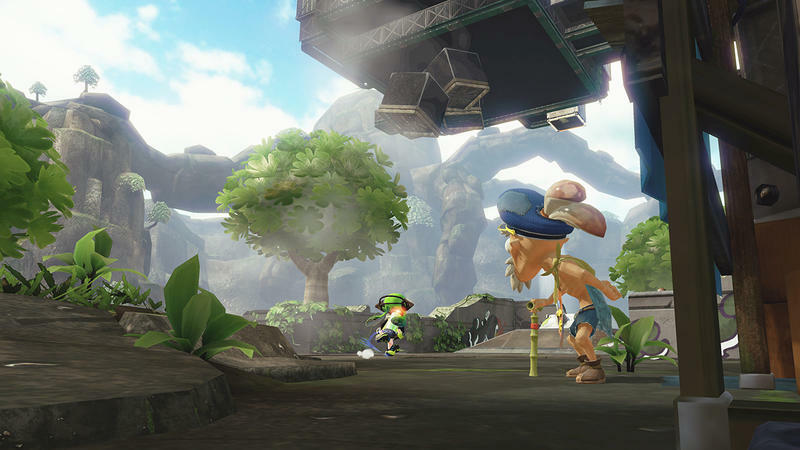 It also looks really great, and stands as an amazing feather in the Wii U's cap. 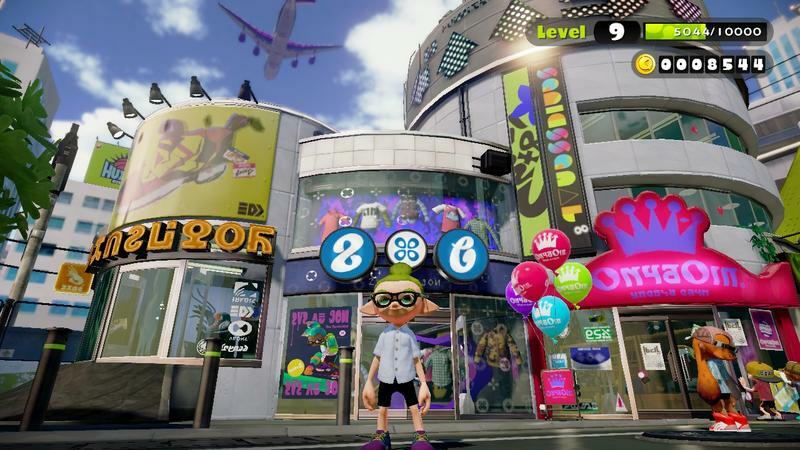 It is light on content, though, and gamers who buy Splatoon on or near day one will face nearly a month of not enough stuff. The first week or so should be fine, but you'll quickly wish there was more out there. Nintendo has promised that they will support this game with constant updates, and I absolutely dig that decision. I just wish I wasn't dying for that first update so soon. Make no mistake, the free content will help, it just needs to get here quickly. 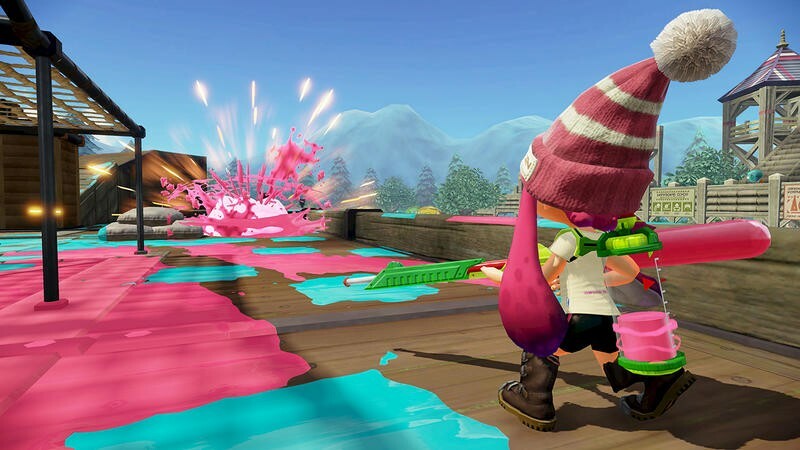 Splatoon is a buy if you want to support Nintendo's new shooter straight away and you don't think you'll get too bored with the content. Personally, I'd be snapping this up right away even in light of the lack of maps and modes at launch. If you think you will be bored with what's initially offered, wait. Don't wait for a price drop, because that likely won't come anytime soon. Instead, wait until August or September when Nintendo's had multiple massive content updates to get this. You'll be swimming in ink covered goodness by then. 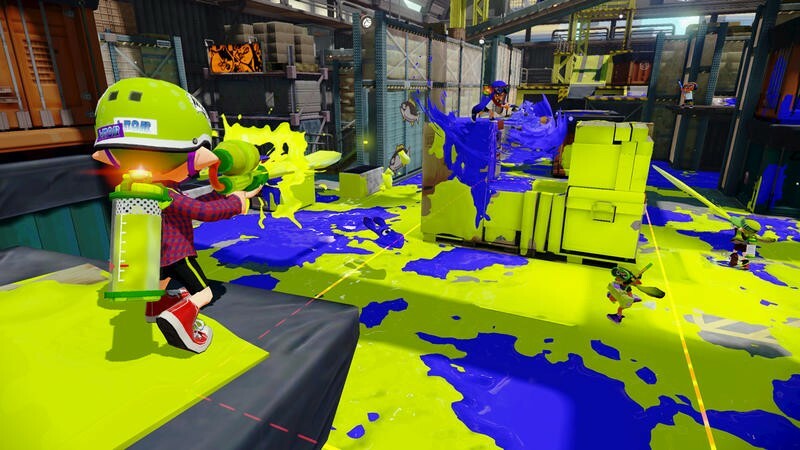 Disclaimer: We received a code to download and review Splatoon on the Wii U. We beat the campaign, logged 30 hours online and used the amiibo we also received before starting this review.